PC Security protection options available today are only reactive. The PC security business does offer a degree of protection from the evils of malware, but suffers from one structural problem: its products are, by definition, reactive. When a particular piece of malicious software appears, it is analysed in order to determine its distinctive “signature”, which will enable it to be detected when it arrives at your machine. Then a remedy is devised and an update or “patch” issued – which is why your PC is forever inviting you to download updates – and why IT support people always look pityingly at you when you explain sheepishly that you failed to perform the aforementioned downloads. Naughton sees an industry on the brink of a radical transformation – born out of necessity. 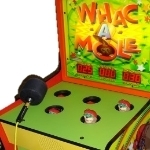 The reacitve, “whack-a-mole” approach to protecting computers – will no longer work. PC Survival Time–a chart that tracks how long it would take an unprotected Windows computer to the internet, to become infected by malicious software? The Pit Blog Computer Security. permalink.